Mr. McGovern - Our Lady Queen of the Apostles, Clonburris N.S. Congratulations to all the third class who competed in their first cross country race in February. Here are some photographs taken on our Going for Gold trip to the National Print Museum. Congratulations to all of the boys and girls who made their First Holy Communion on the 19th of May. Here are just a few photos of some of the children taken on Monday. Thank you to all the parents who came in to our class to partake in our Maths For Fun sessions! 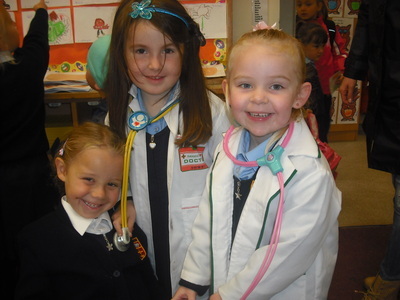 Thank you to all of our visitors on Grandparent's Day last Friday. We really enjoyed showing you our work in the classroom and singing our song for you. 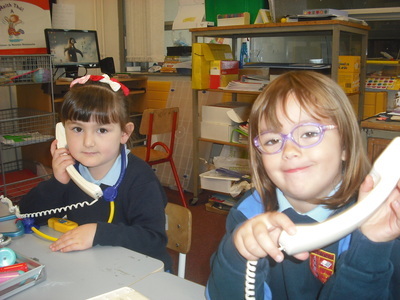 Here are some photographs of just some of our grandparents who came in to visit us. Here are some links to two great websites as Gaeilge! We are busy preparing for Christmas. Today we made Christmas decorations. Well done to all the boys and girls who performed in our Christmas concert. We preformed on Tuesday, Wednesday and Thursday night. We had a WHALE of a time! Here are some photographs taken before our performance. 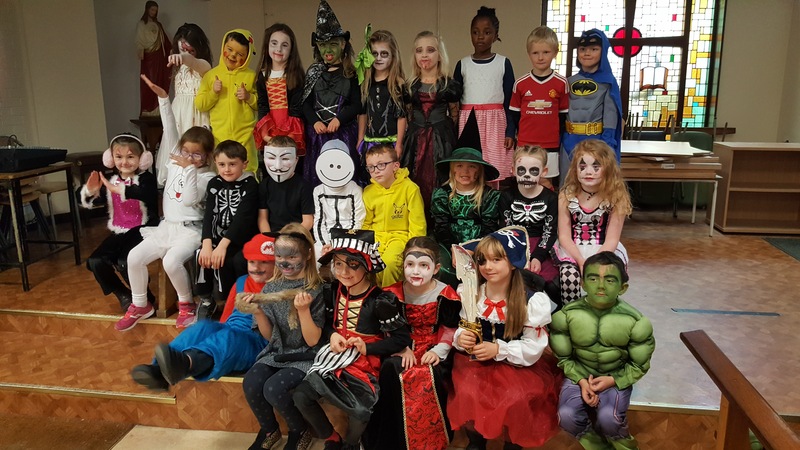 Check out our Halloween skeletons! 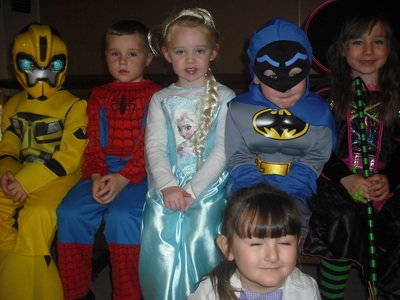 All the children dressed up in Halloween costume. We had lots of fun! Here are some photographs of the day. We had lots of fun during Active Schools Week. Take a look at some of the photographs from the week! Congratulations to all those who won medals and well done to all who participated on the day! Our Sports Day was on Wednesday. We had a great day out on the field. We did the bean bag race, the egg and spoon race, the sack race and girls and boys sprint. Take a look at some photographs from the day! We are really enjoying our GAA lessons on Thursday afternoons. 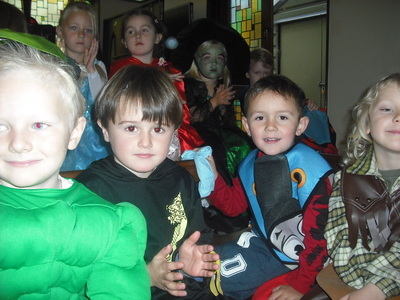 ​Have a look at our photographs below. We went to Lullymore Farm on our school tour on Wednesday 17th May. We had lots of fun in the playground. The train brought us all around the bog and dropped us off at the Fairy Forest. We saw the Fairy Village and we all made a wish! Thank you to the parents who came along with us on the day. Thank you to all the parents who came with us on our Sponsored Walk. We had lots of fun! 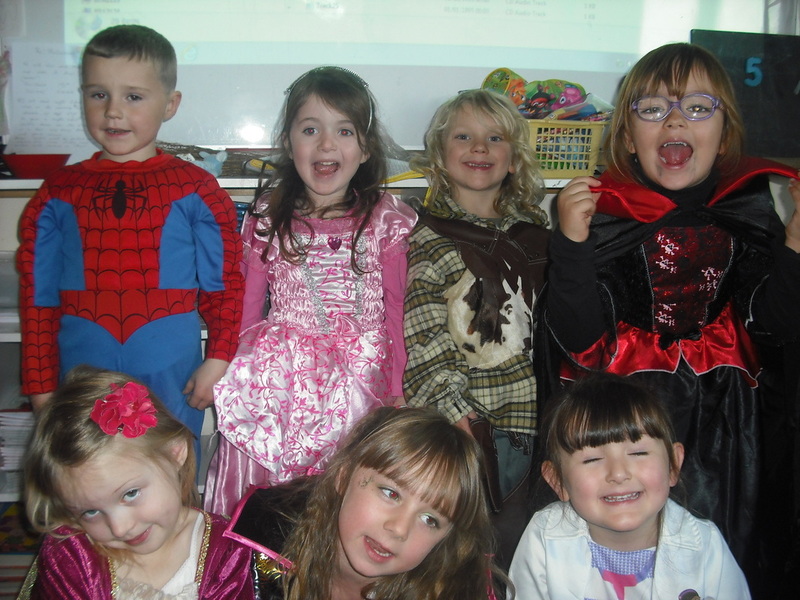 We celebrated World Book Day. Everyone dressed up as their favourite book character. We had a parade in the hall to celebrate. Check us out! We had lots of fun dressing up this year for Halloween. 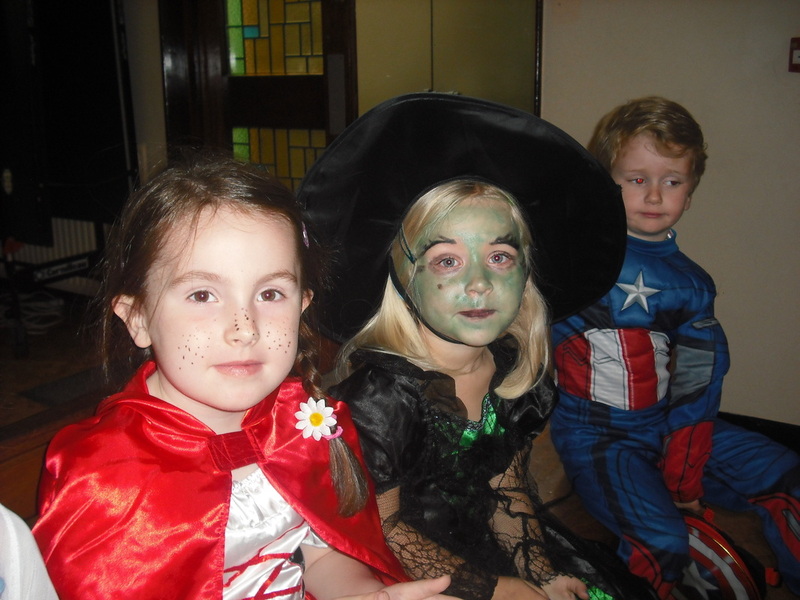 Our class joined the other 1st classes for a spooky parade in the hall. We all had a wickedly wonderful time! Here we are playing percussion instruments with Sinéad from The Magic of Music. We loved playing them. Today we had a mini-beast hunt in the school garden. We saw spiders, ants, bees, slugs, wood lice and lots more! We searched and found the insects hiding under pots, in the soil and around flowers and leaves. 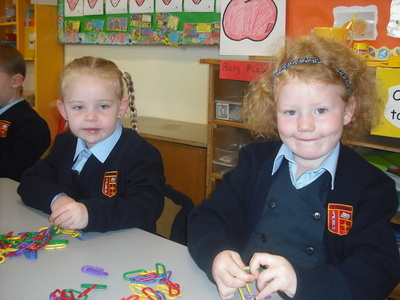 Well done to our two Pupils of the Week and our Gaeilgeoir na Seachtaine. 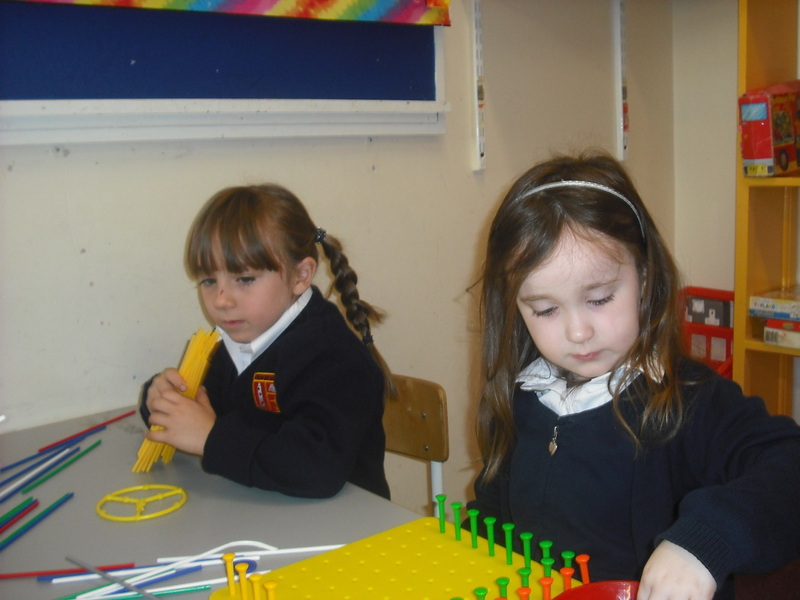 In Art, we made some lovely paper weaving. They were a bit tricky at first to do but we all managed them. Well done to every one who participated in our recent Sports Day. We all had great fun. Congratulations to the winners! Today was the first day of our Active Schools Week. Here we are doing our 'Wake Up, Shake Up'. It was such fun and a great way to wake us up first thing in the morning!! We look forward to more of the same for the rest of the week. Here we are with our Stay Safe booklets and certificates. We now know how to stay safe! See all our smiling happy faces!!! Not long now for the summer holidays. 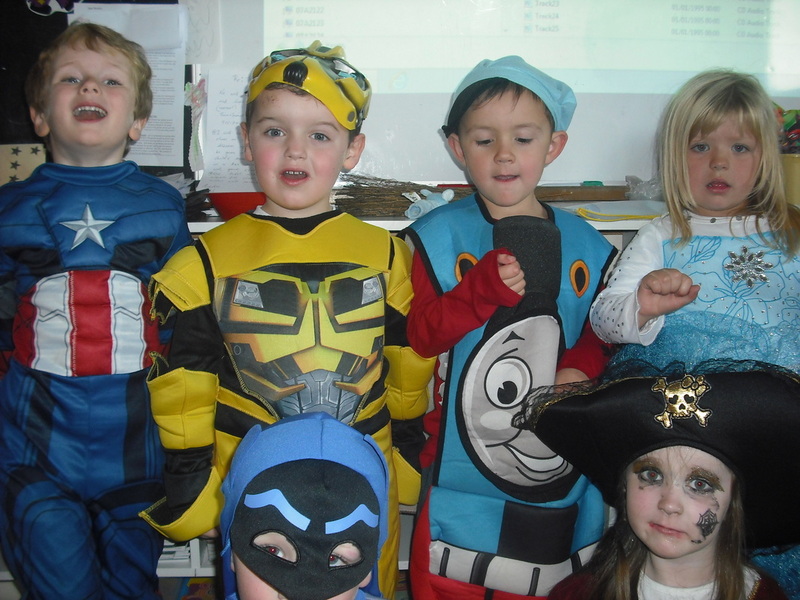 We had a great time together again this year and look forward to another brilliant year in 1st class!!! As part of our Intercultural Children's Art Festival, we were delighted to have a storyteller visit our classroom. He told us lots of stories. We especially loved the story of 'The old woman who swallowed a fly' and we even sang the song about it! In Aistear, we made Father Day greeting cards. 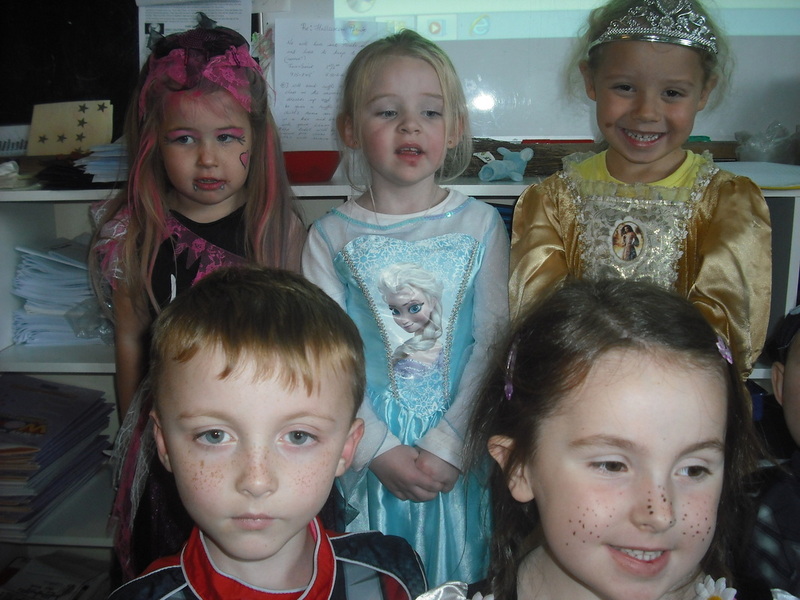 We used feathers, brightly coloured stickers of flowers and lots of glitter so they turned out amazing!!! All the Dads will be so happy when they get them on Sunday! We had great fun during PE using the parachute. We played lots of games with it and then we made a big tent and all sat inside it singing 'Ole Ole' to cheer on the Irish Team!! Pupils of the Week and Gaeilgeoir na Seachtaine. We had a visit from two members of the Road Safety Authority to help us stay safe when crossing the road and to teach us how to travel safely in cars. We even got our own Road Safety Licence!!! As it was such a beautiful day, we went on a visit to our lovely school garden to read our books. It was great being out together and enjoying the sunshine! On Wednesday of this week, we all had a great day at our School Sports Day. Senior Infants took part in the following five events: Egg and Spoon Race, Sack Race, 30m Sprint, Bean Bag Race and Musical Hoops. Here are some of the activities which took place during Aistear this week. The other half of the class made their prints, read together and made thumb pots using playdoh. We also had our Sponsored Walk during the week. We enjoyed chatting with our friends as we walked along together. Thank you to all the parents who joined us!! We had a fabulous time yesterday at our school tour to Imaginosity! There was SO much to see and do and we all had such great fun. In Science, we explored how shadows are formed. We also had fun waving at and chasing our shadows!! In Aistear, we enjoyed doing Junk Art based on the topic of Summer. They are on display in the classroom if you would like to see them. Here are a sample of some of the beautiful art. During art, we made beautiful pictures using prints. We enjoyed using lots of different coloured paint. Take a look here at some of them. They will all be displayed outside our classroom during next week. Come and take a look! Using playdoh, we made thumb pots using coils. Amazing pots and bowls were made, along with cups with handles! 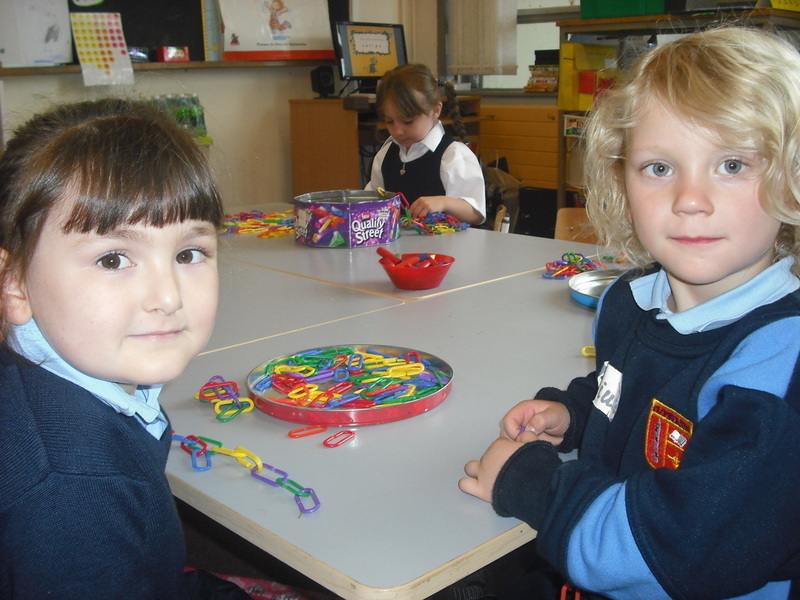 Here are some of the activities we did in Aistear this week! We chatted all about special occasions. They were so many, we made our list into a mind-map! Come see our beautiful paintings outside Room 5 of things we like to do. The paintings are full of lots of colour! In Science, we discussed which materials can soak up water (sponge, newspaper, plastic, cloth, tissue and tinfoil). After our predictions, we did investigations and then recorded our findings. We loved the story 'Barry the fish with fingers'. We chatted about all the things and creatures that live in the sea and then did some beautiful art using a wax resist technique. Come and see the amazing drawings of mermaids, seaweed, sharks, jellyfish etc. outside our classroom. 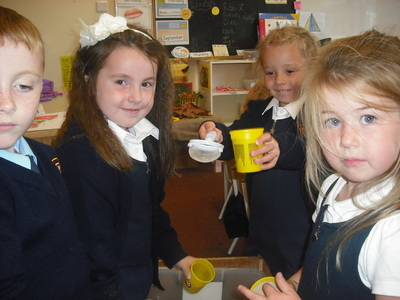 In Maths, we learnt all about capacity and used language such as full, empty, nearly full, nearly empty and half full. We also had great fun filling and emptying bottles and containers. In Aistear, we designed paper boats. They were so colourful! We made our own bubbles using water and washing-up liquid. 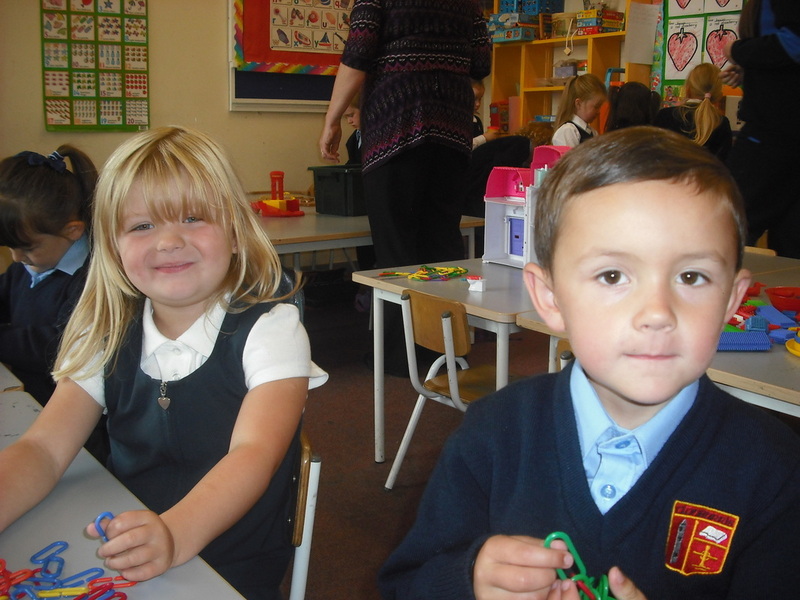 We had great fun making bubbles of every shape and size!! 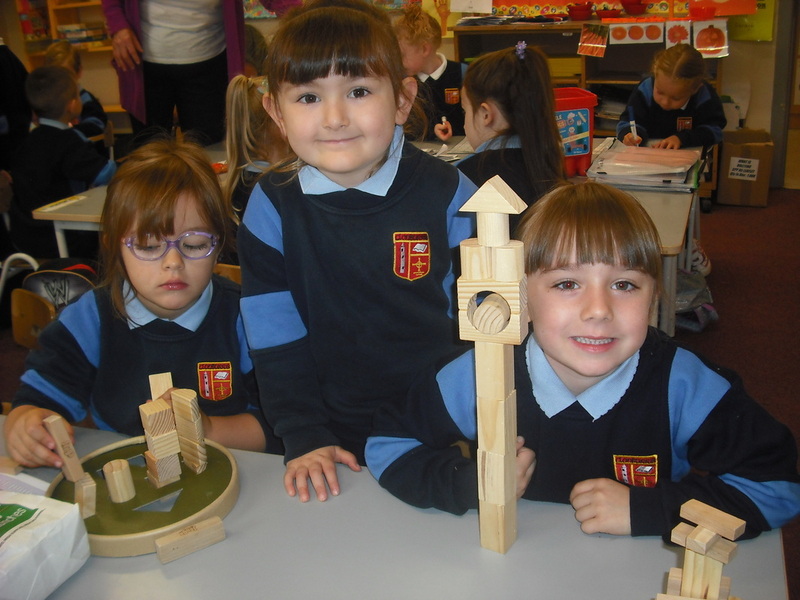 This week in Aistear, we enjoyed water play, construction and playing in the small world area along with Maths games using dices and memory card games. In Science, we predicted, investigated and recorded things that floated and things that sank. It was very interesting and exciting to be scientists! We loved the story called The Rainbow Fish! 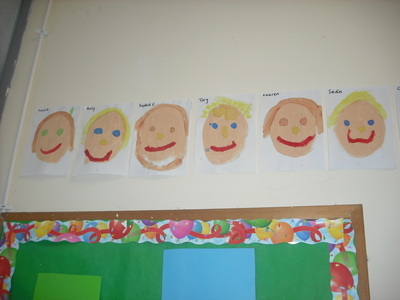 We did beautiful art based on it and even did drama where we all had a part i.e. the rainbow fish, his friends, the starfish or the wise octopus. Each group took a bow at the end of their performance and got a great applaus!! We did individual mind-maps to record places where water is found in our homes, in the environment and the animals that live in water. We chatted about conserving water while brushing our teeth and washing our hands. Also, we now know all about the water cycle! Look at our amazing paintings based on The Water Lilies by Monet. Come and see them outside our classroom! 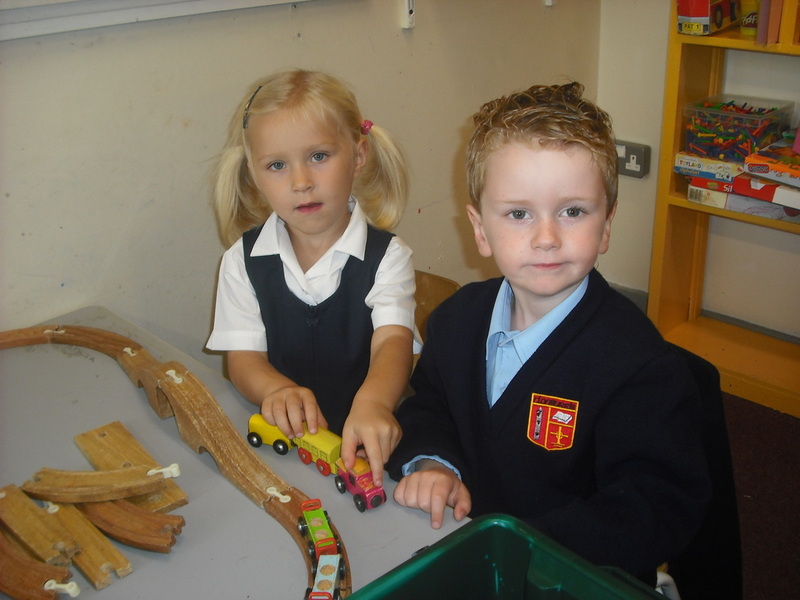 We learnt all about the different types of transport. We then did a mind-map to record them. 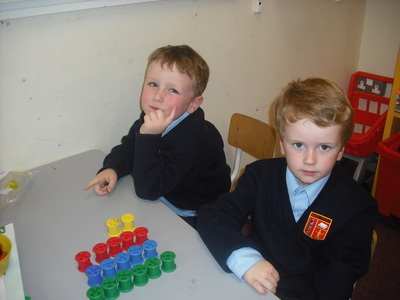 In Maths, we made sets of 10! Here are some samples. 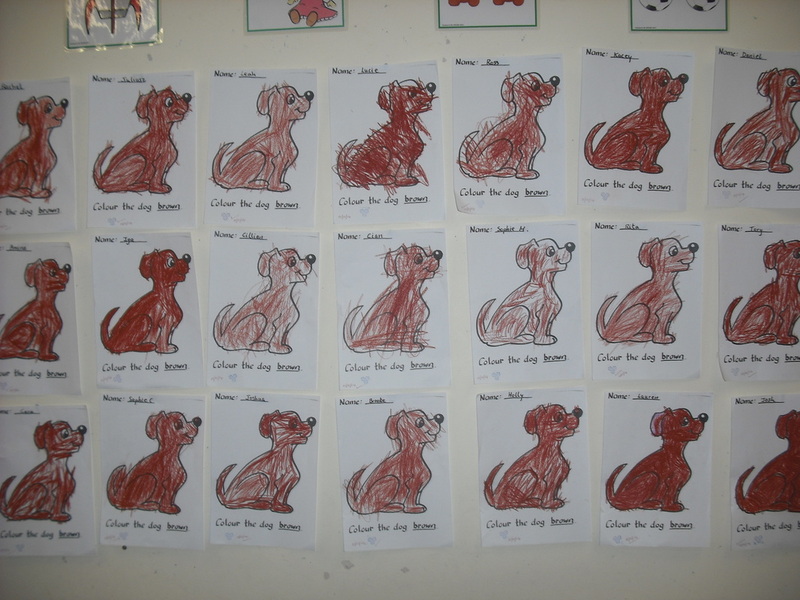 The children all did amazing sets and coloured them in so nicely. We loved the story of 'The Snail and the Whale'. 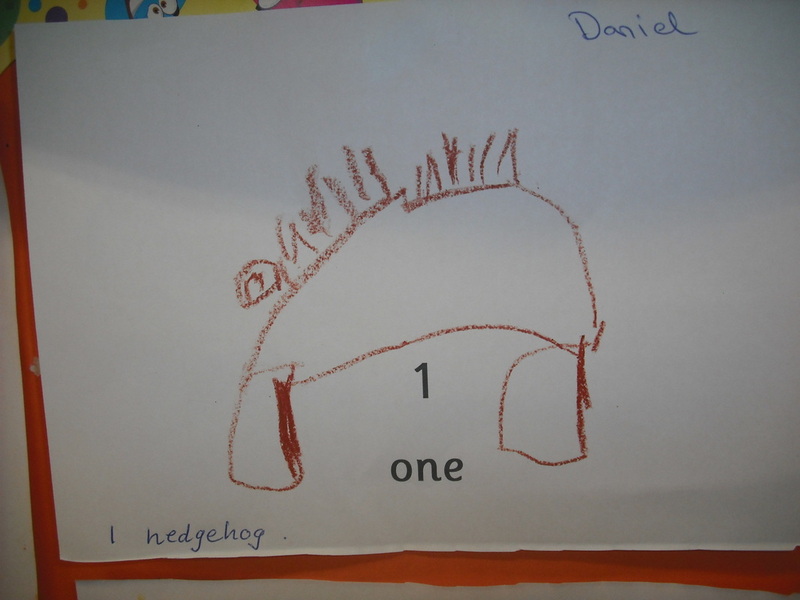 We wrote about our favourite part and illustrated it with a picture. Come and see them outside Room 5! In Religion, we chatted about our favourite stories from the Bible. Here are a few of them. We listened to a piece of music called 'The Flight of the Bumble Bee'. We then did beautiful collages based on the music. You can see the rest of them in our classroom. They really brighten up our room! In Aistear, we made bumblebees and other insects from playdoh, read stories together, did brilliant constructions with lego and blocks and lots more. Last week, we read the story called 'Davy's Scary Journey' so this week during Aistear, we planned and recreated Davy's journey. He thought he had gone as far as the grassy plains of Africa when in fact he only went to the next field!! 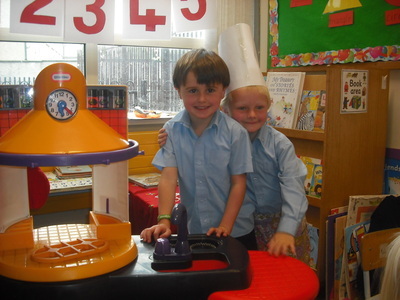 This week in Aistear we played at being shop-keepers and customers in a toy shop. We are learning how to recognise 20c and 10c coins and revising all about 1c, 2c and 5c and how to use the coins. There were some great bargains to be had in the shop! The children did some amazing junk art which is hanging in our classroom. 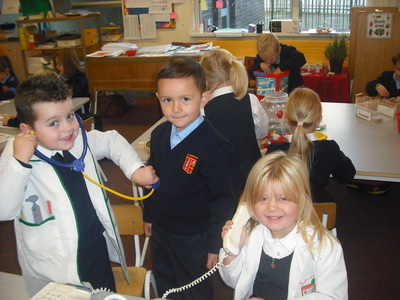 We chatted and learnt all about the different types of professions. We then drew great art work of what we want to be when we grow up!! Come and take a look at the beautiful pictures and great writing outside Room 5! We also had good fun dressing up as some of the professions! See our lovely Easter Bonnets which we made during Art. HAPPY EASTER!!! 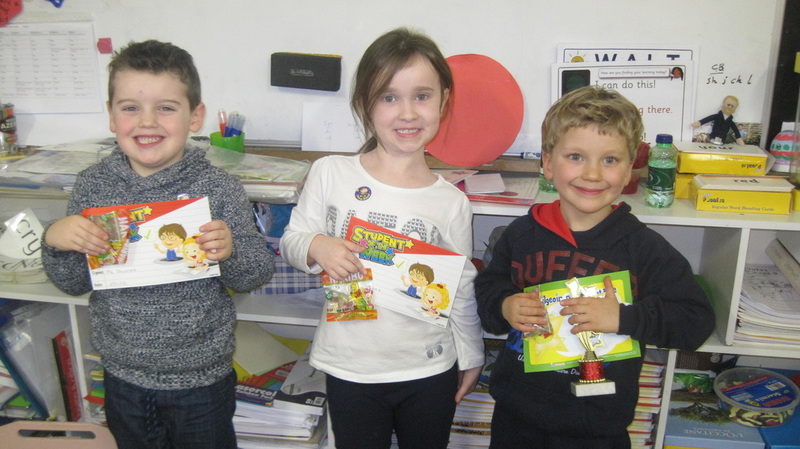 Congratulations to the Pupils of the Week and Gaeilgeoir na Seachtaine!!! We had a very busy week with our school concert and the raising of the Irish flag for the 1916 Easter Rising Commemoration. 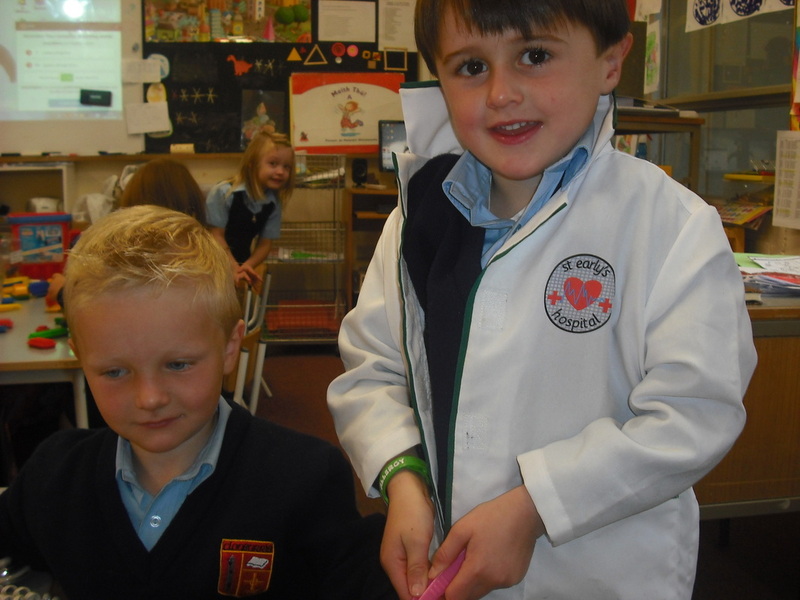 We also learnt all about St. Patrick and made lovely cards to mark the day. We loved having our family members in to read with us in Room 5. Thank you to all of you who could join us! Ms. Dempsey set up a book shop in Aistear along with a puppet show. We had great fun performing for each other! This week was World Book Week. 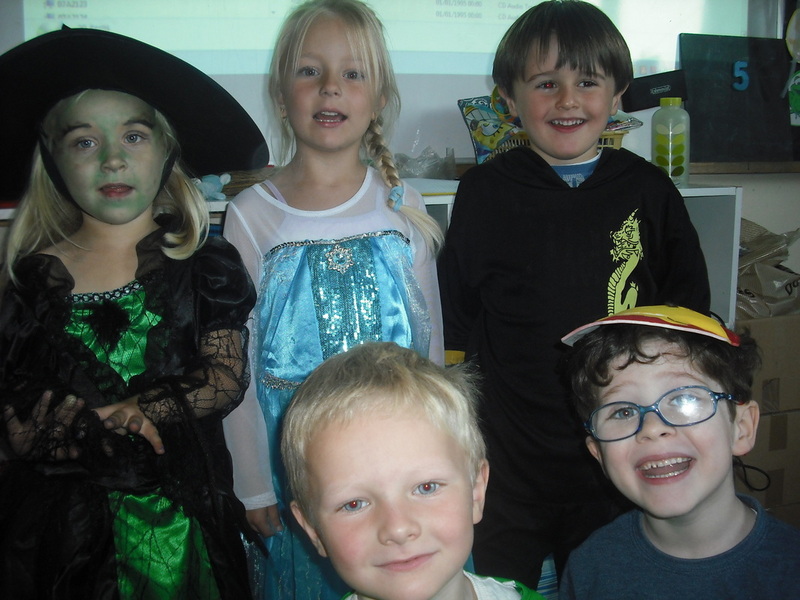 We dressed up as a character in our favourite book. 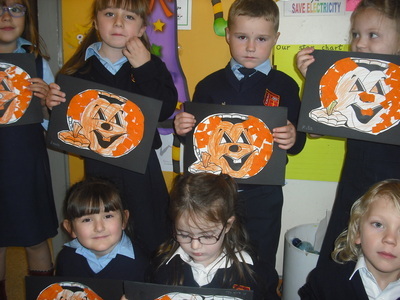 We did art work based on World Book Week. Come see it outside our classroom! We even had an author named in to visit and she told us amazing stories. Some members of our families came in on Thursday to do paired reading and we loved having them with us! Congratulations to the winners and well done! In English, Ms. Dempsey read the story 'The Rainbow Fish'. 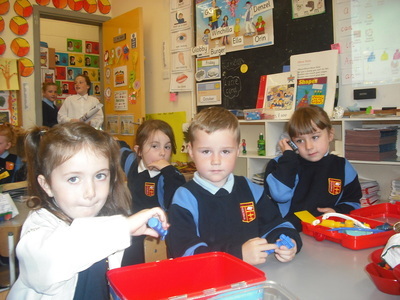 Then in Aistear, we made a seabed with playdoh and pebbles. We even enjoying fishing using a cool fishing net! We set up an aquarium during Aistear and did some swimming using a swimming ring. It was all great fun! We had a lovely walk-about in both the school garden and the garden at the front of our school. We saw all the Spring flowers i.e. snowdrops, daffodils, buds on the trees and lots more. We recorded all of what we saw on a work sheet. 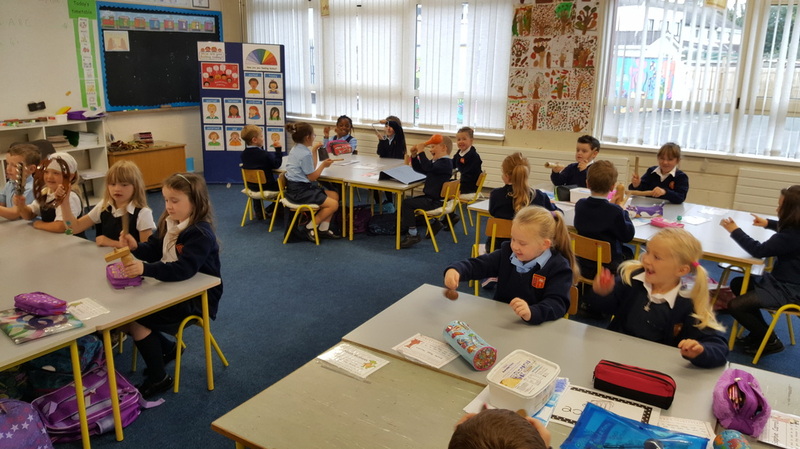 All the children in Room 5 are doing great with their reading and are now enjoying reading on their own or in pairs during Aistear. Well done to all the children who took part in the WOW walk last Wednesday. It was a great way to start the day! We enjoyed the story Walking in the Jungle and did amazing art work based on the storybook. 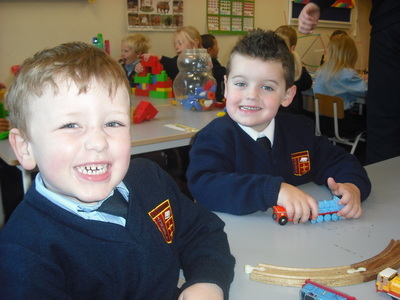 We had great fun this week during Aistear. 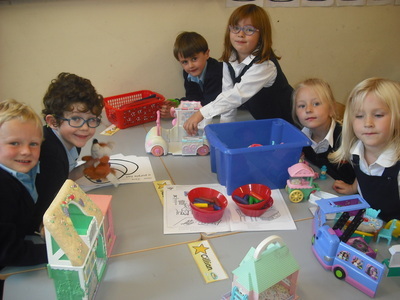 Ms. Dempsey set up a Pet Shop where children had an opportunity to be either the shopkeeper or the customer selling or buying fish food, dog food, toys for pets etc. In Small World play, we enjoyed recreating scenes from the story 'Handa's Hen'. We are all famous as we were on TV on Monday telling our news about the weekend! Ms. Dempsey read us the story of Handa's Hen which we really enjoyed! We then wrote letters and posted them to Handa. Have a look at our great art work outside Room 5. 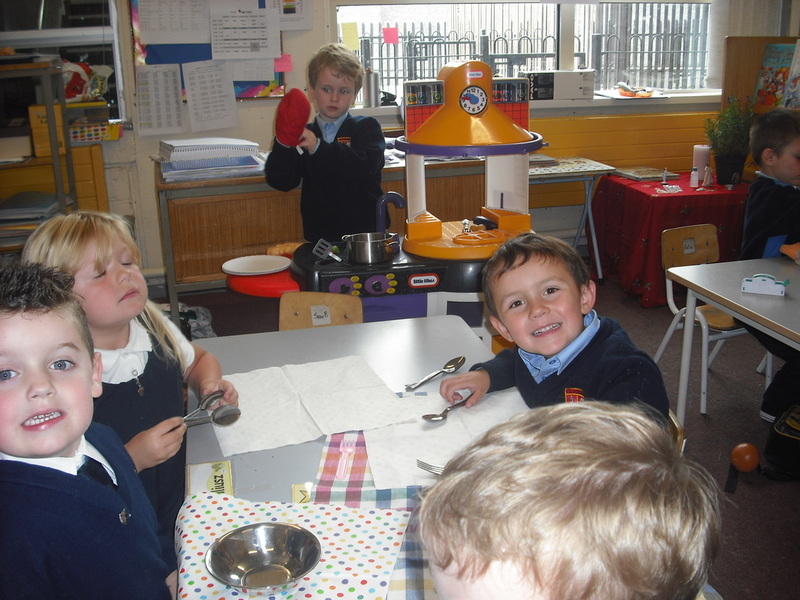 In Science, we experimented how cream can be changed to butter! We then enjoyed some of our delicious butter spread on crackers. Yum yum!!!! 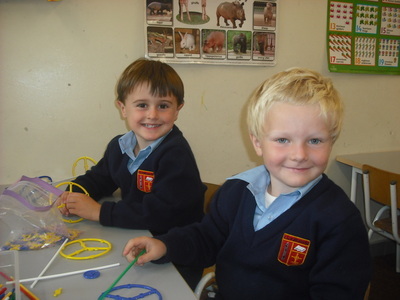 In Aistear, we also enjoyed water play and sand play. Today was a very special day as lots of grandparents come to visit and chat with us in our classroom. We all had a lovely time together. We remembered the grandparents who couldn't be with us today. We have been learning about the animals that live in the arctic e.g. the reindeer, the arctic fox and the polar bear. We enjoyed doing some polar bear art. Come and see it out outside Room 5! We have a great book in our class library called 'Pirate Ship'. It can be made into a ship! We had good fun with it when one child pretended to be the captain and the others were sea creatures in the water. We had whales, sharks and even mermaids swimming around the ship! We experimented by mixing different colours and made teal, purple, grey and orange along with some other very interesting shades of colours. Here are some activities which we did during Aistear. This week we enjoyed the story called 'The Emperor's Egg' and learnt lots of amazing things all about Emperor Penguins. We then did fabulous art and put together some interesting facts all about them! Did you know that penguins live in the coldest and windiest place on earth!!! We all agreed that we definitely wouldn't like to live there!!! 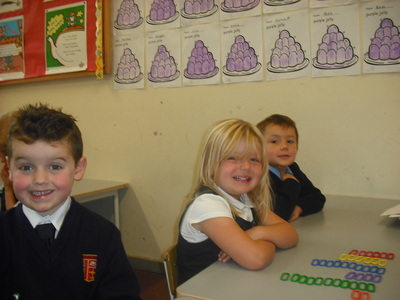 In Maths, we learnt about 'length' and when to use the following Maths language i.e. 'longer than, longest, shorter than, shortest'. 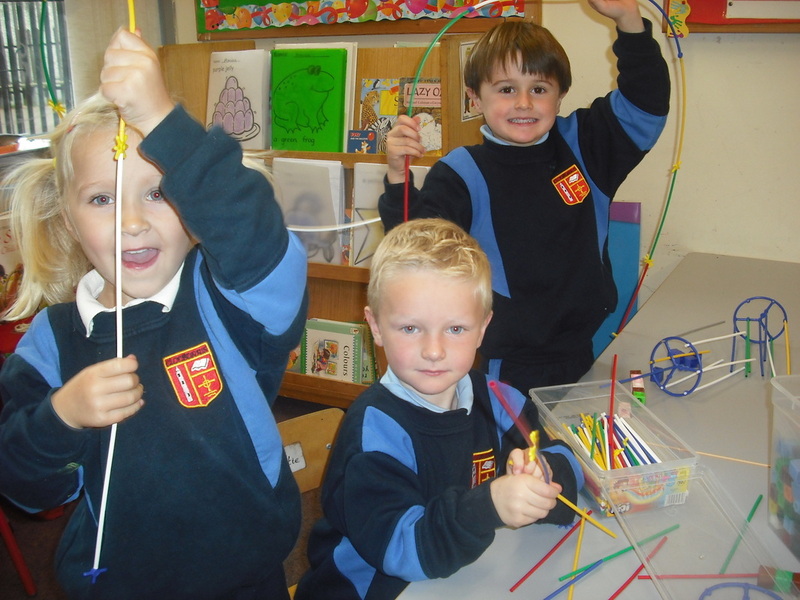 We measured things in the classroom and will be continuing with the topic of length next week. Here you see children measuring how many notebooks it takes to measure one side of their table. WISHING YOU ALL A VERY HAPPY NEW YEAR AND A GREAT 2016!!! This week we read 'The Ugly Duckling'. During the story, we chatted about our feelings and how things we say can make others feel. 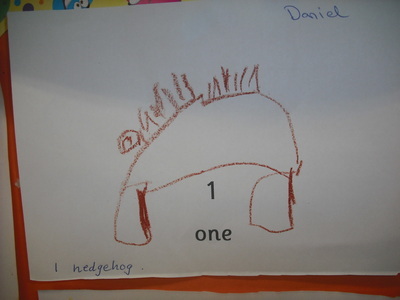 We then drew pictures and wrote about the story. We even made a class collage and discussed what to say in the speech bubbles. 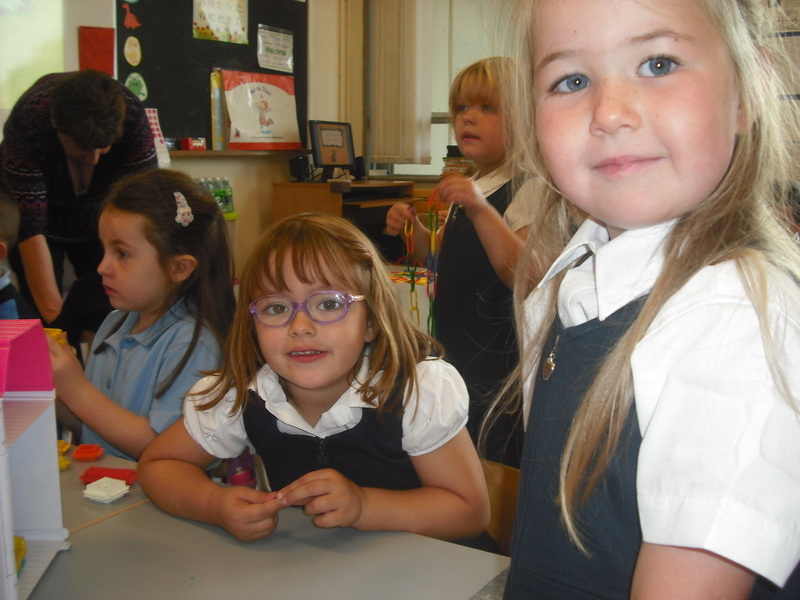 We had good fun singing and miming to the song 'The Ugly Duckling' and made swans and ducklings out of play-Doh. 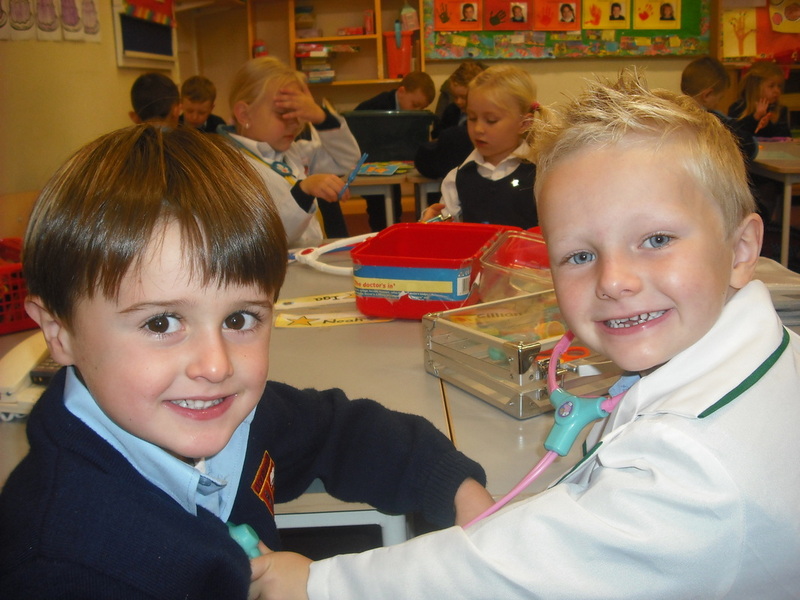 We are all delighted to be back to school and everyone is working hard! 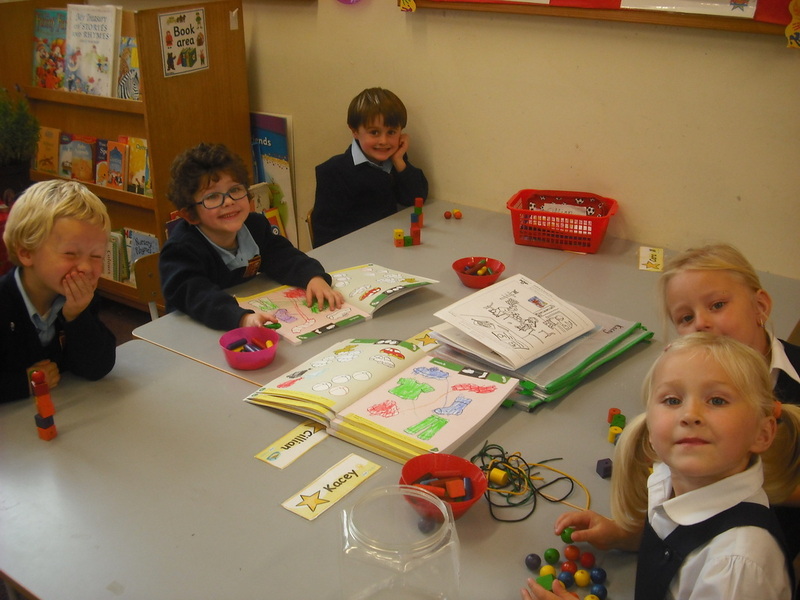 The children in Room 5 love to read and are doing really well with their reading! Here we are enjoying reading books from our library. Sometimes we like to read in pairs where we take turns reading the pages. 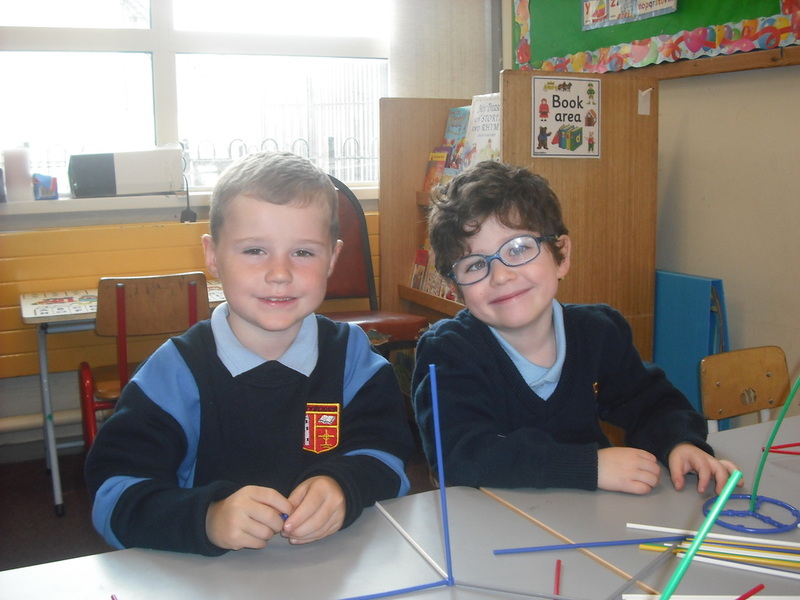 In Aistear, we made some very creative constructions using blocks, straws and lego, along with some interesting pictures and 3D shapes made with playdough. Thank you to Noah's Dad who gave each child a hyacinth bulb. We enjoyed observing as the bulbs flourished into beautiful flowers with magnificent fragrances. The lovely scent filled the room! 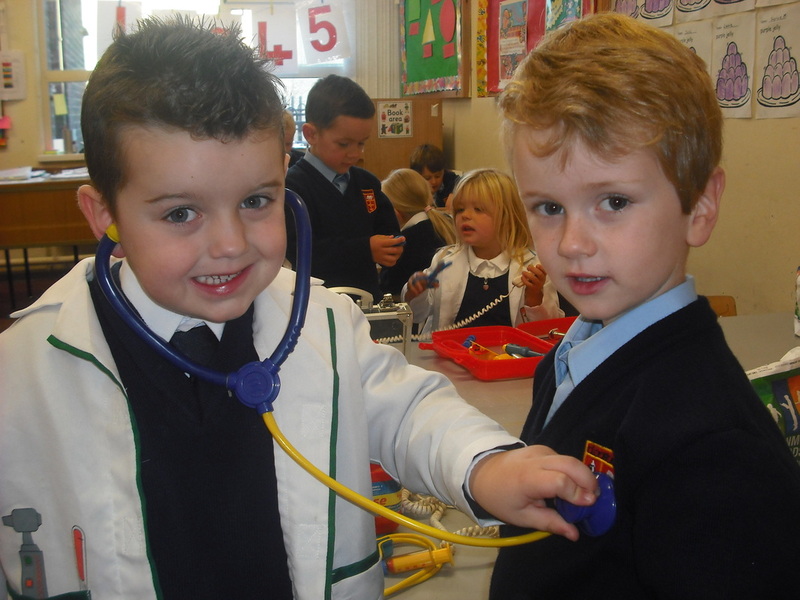 We had another busy time in Aistear this week. We had great fun exploring colours made by mixing the primary colours (red, yellow and blue) along with white. The children made lovely shades of pink, purple, green and many more colours of the rainbow! 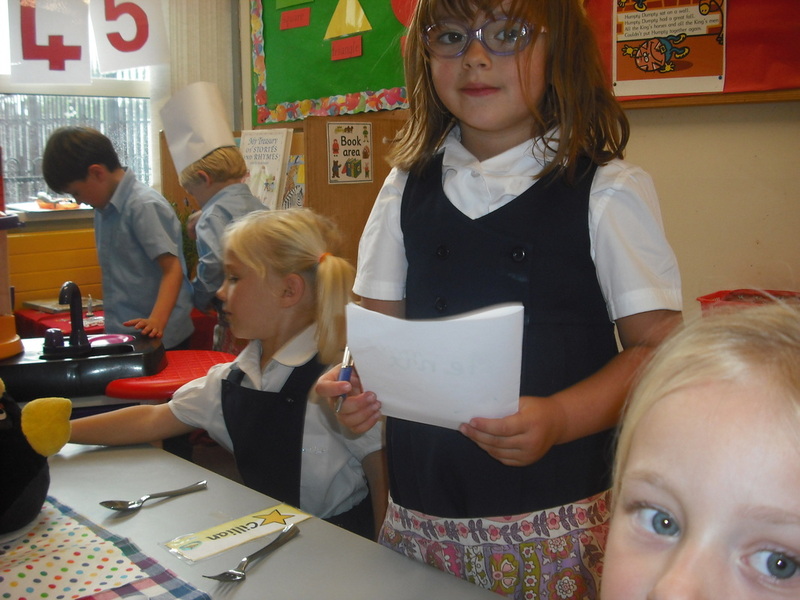 We had a fruit and vegetable shop in the classroom and did lots of selling and buying. Children then made amazing shopping lists and will now be help with the shopping lists at home! Lots of fun was had too with the play-doh. Congratulations to the three winners. Ms. O'Neill taught us a fun song called Tony Chestnut. Here we are singing and miming to it. Don't we sound and look great!!! 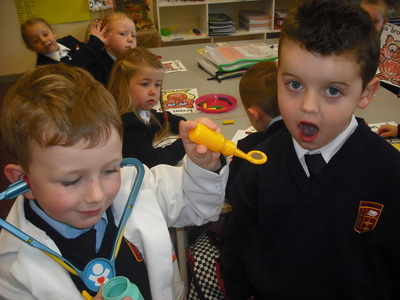 We chatted with Ms. O'Neill all about the food pyramid and healthy food to eat. Next we made faces using grapes and slices of bananas and cucumber on brown bread. We then enjoyed a healthy snack!!! In Aistear, we made jigsaws and lots of interesting 3D shapes. We also made paper collages and even had a doctor's surgery in our classroom. It was all great fun! In Art we made beautiful fairy doors using paint, colourful lollipop sticks, buttons and glitter. I wonder what fairies live behind these doors! PUPILS OF THE WEEK AND GAEILGOIR NA SEACHTAINE. Congratulations to our three winners! Ms. O'Neill read us the story of 'Little Red Riding Hood'. We then did a story wheel based on it. Here are two samples. 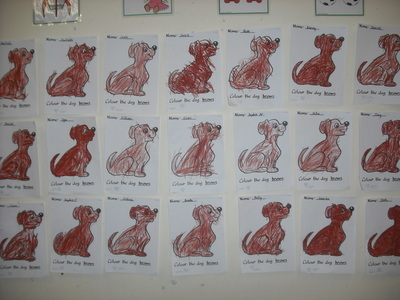 Have a look at the rest of them outside our classroom and see lots more lovely drawings! We even wrote a letter from the wolf to Granny and Little Red Riding. Come and read them outside Room 5. 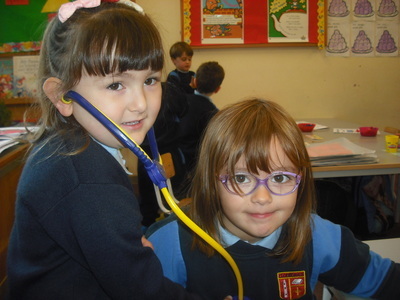 We were very busy this week in Aistear and learnt lots of new things. We sorted materials in the environment for example things made of wood, metal, textiles, plastic, glass etc. We did great paintings of our favourite part of the story Little Red Riding Hood. 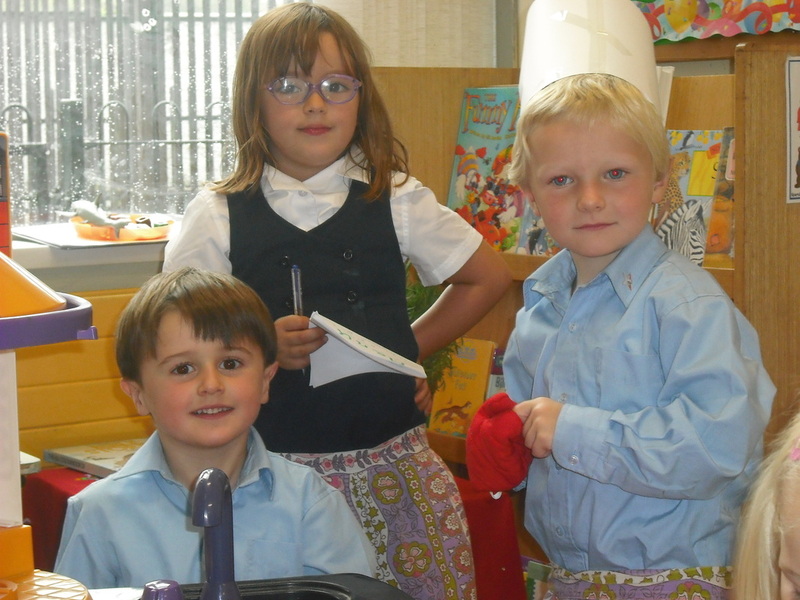 We also had great fun doing role-play of being a family. Everyone had a chance to be at least two of the characters i.e. mammy, daddy, granddad, sister, brother or baby. We discovered that a baby needs a lot of care and minding!! 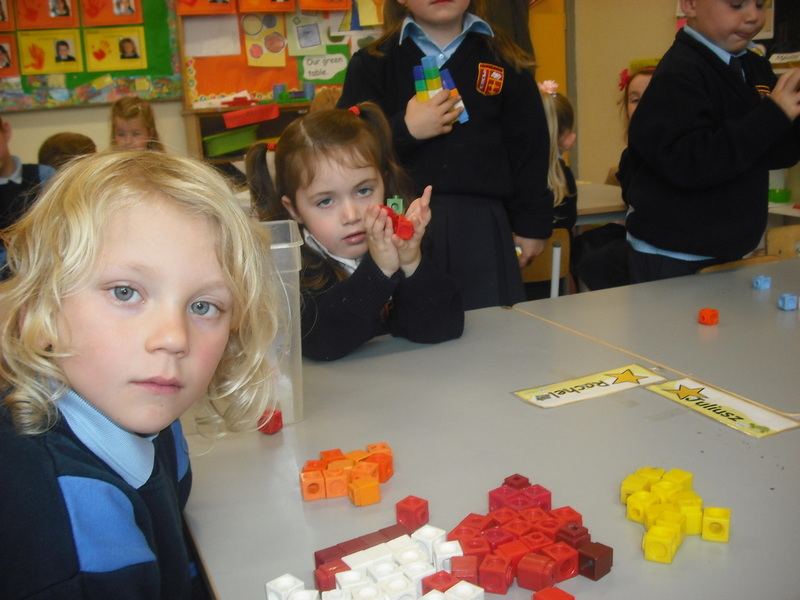 In Maths, we enjoyed exploring how we could make 2D shapes into 3D shapes! We chatted how we can help at home and came up with some very good ideas. For example we can help to tidy up our toys, help with the dishes or make our beds. 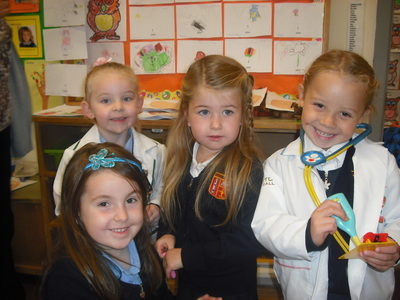 Congratulations to the Pupils of the Week and Gaeilgeoir na Seachtaine. Well done to the winners! 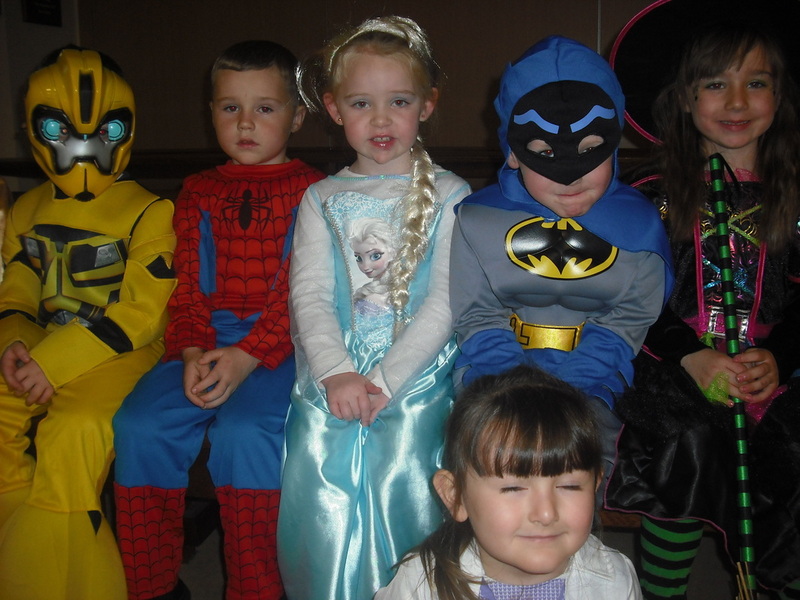 We all so enjoyed dressing up! Don't we look great??? Happy Halloween!!! 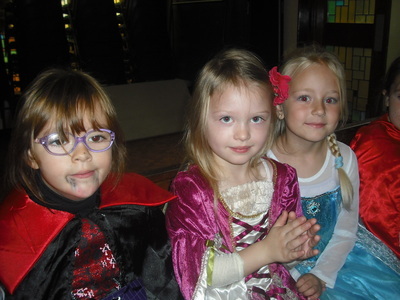 We had a great week celebrating Halloween. Look at our brilliant art! 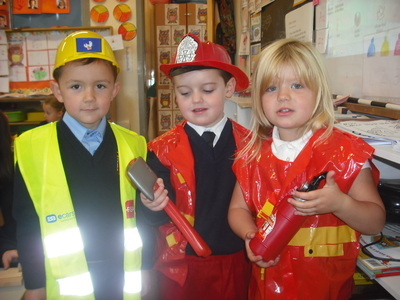 We also learnt how to stay safe at Halloween. made lovely 'black and white' art and also really enjoyed working or being a customer in the restaurant. Some delicious combinations of food were served up on the one plate!! We are learning all about autumn and the beautiful colours associated with it. Have a look at our lovely art displayed outside our classroom. We also went on a nature walk to see all the fallen leaves. We enjoyed the walk and did some bark rubbings along the way! In P.E. we are exploring the topic of gymnastics. Here we are enjoying doing balancing activities. 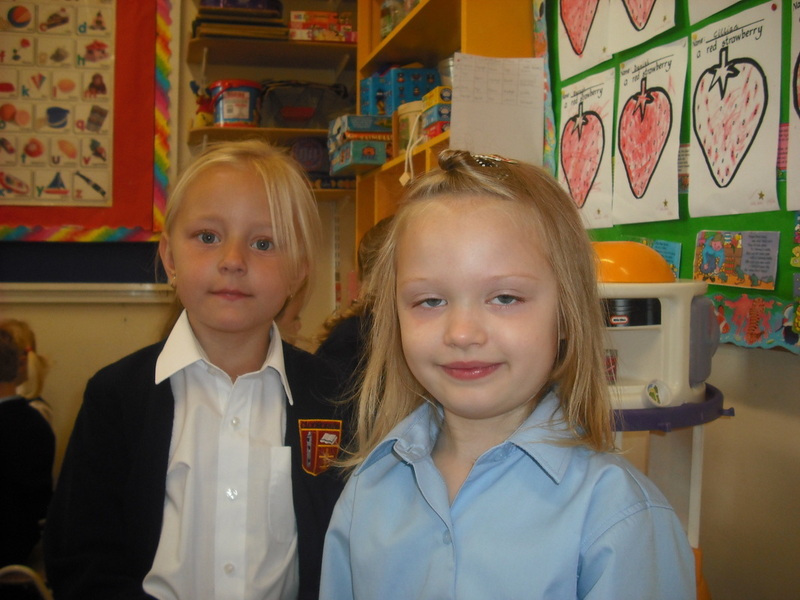 Well done to all the children who joined us on our WOW – Walk on Wednesdays. It was a great way to start the day! There was great excitement when Jim Gavin and other members of the Dublin team came to visit the school with the Sam Maguire cup. We all gathered in the hall to celebrate the occasion and sang ‘Molly Mahone’. The atmosphere was electric!!! PUPILS OF THE WEEK AND GAEILGOIR NA SEACHTAINE. Congratulations to the winners! Congratulations and well done to the winners. This week in Maths, we learnt all about the story of the number 6 and how we can add up to 6 in lots of different ways e.g. 3+3, 2+4, 5+1 and 6+0 and they all equal 6! 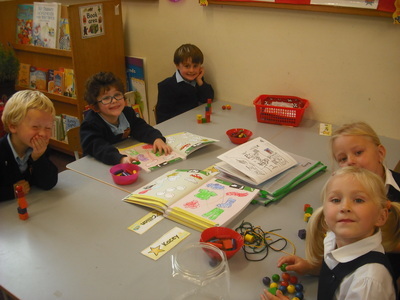 We also did lots of sorting and even did lovely pictures showing sets of 6. We had an exciting visit this week from two members of the Defence Forces to celebrate the centenary of the 1916 Easter Rising. We made lovely flags to help decorate the hall and the whole school sang Amhrán na bhFiann. We all really enjoyed the visit!!! We are enjoying reading 'Ella goes to the Airport'. Here we are making the first sentence of the book. Congratulations and well done to our winners. 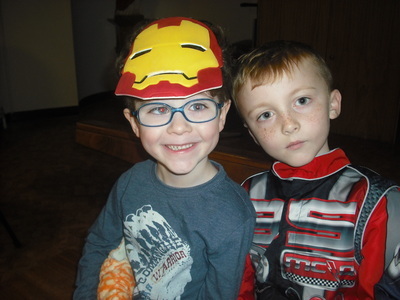 We had a great time at our Teddy Bear Picnic. Thank you to all the 5th class boys and girls who made us lots of delicious sandwiches and refreshing drinks. We really enjoyed the story of 'Norman the slug with the silly shell'. Also, we loved having our parents or grandparents in our classroom doing a cutting and sticking activity of a snail. Everyone was delighted to get their own copy of the book at the book ceremony! Have a look at our amazing art work based on the story on display in the school hall. Wow, what a week we had taking part in Active Schools Week. We loved every minute of it. As part of our annual Children's Intercultural Arts Festival, yesterday we enjoyed a drum workshop. It was great playing the drums and other instruments! We loved the story of 'Norman the slug with the silly shell' so much that we decided to design a shell for Norman! They turned out great and are all so colourful! In Maths, we are learning all about money using 1c, 2c and 5c coins. We bought and sold things to each other. Here are some photos of Room 2 during Golden Time last Friday. 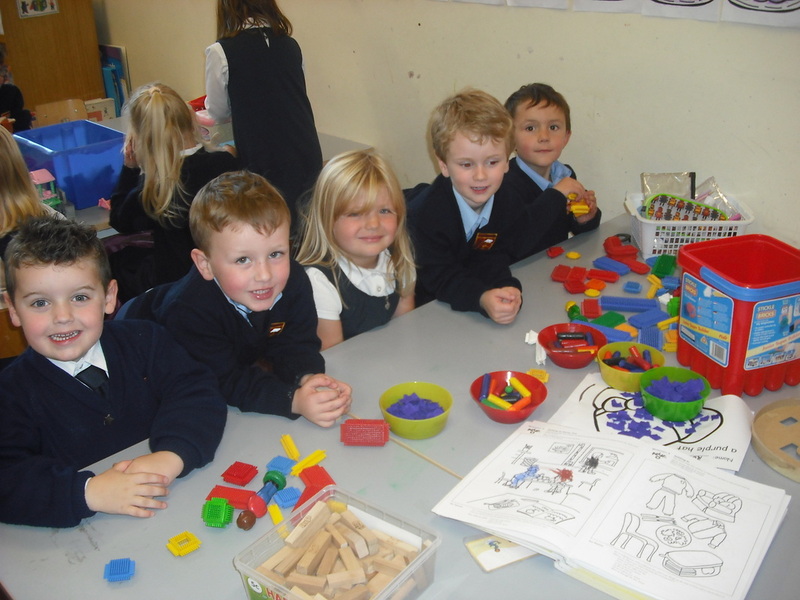 There were some amazing and creative pieces of construction made using play dough, shapes, blocks, lego etc!! We had a very busy week indeed!! We had our school sports day on Wednesday and it was so much fun. 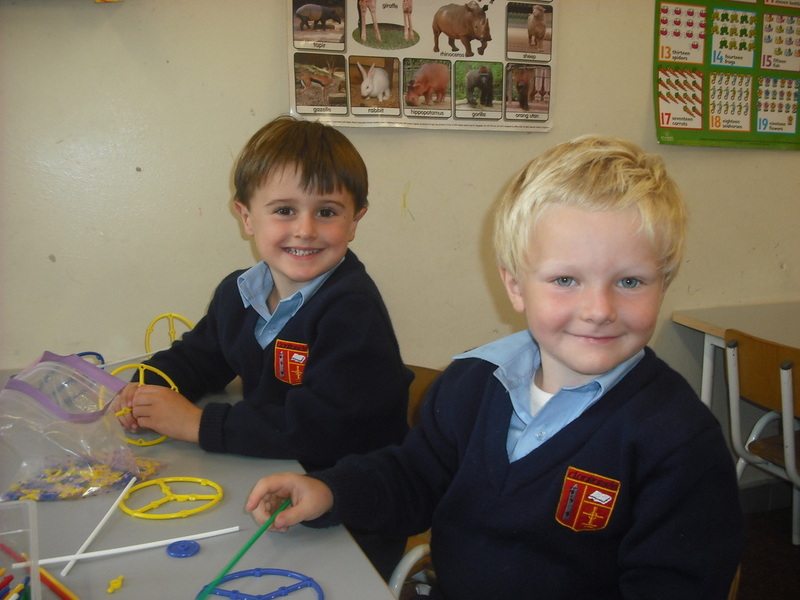 On our school tour to Newbridge Farm on Thursday we saw lots of animals, enjoyed a picnic and then we went to play in the playground. Today, we had our Green Flag ceremony. Here are some photos of us having great fun together!! This week we learnt how to write ‘u’ and ‘v’. To write ‘u’, say ‘down, around, up, down and tail. To write ‘v’, ‘slant down, slant up. 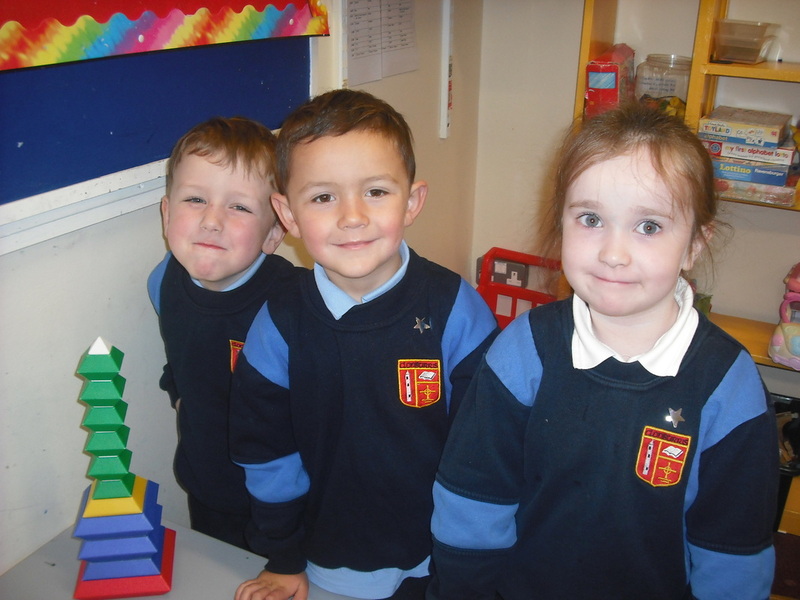 In Maths, we are learning all about height and the language we are using is 'taller / shorter / tallest / shortest / the same height’. We visited the school garden and saw the beautiful flowers growing there. We also explored the herb garden. The rosemary, mint and fennel smell lovely and fresh!! 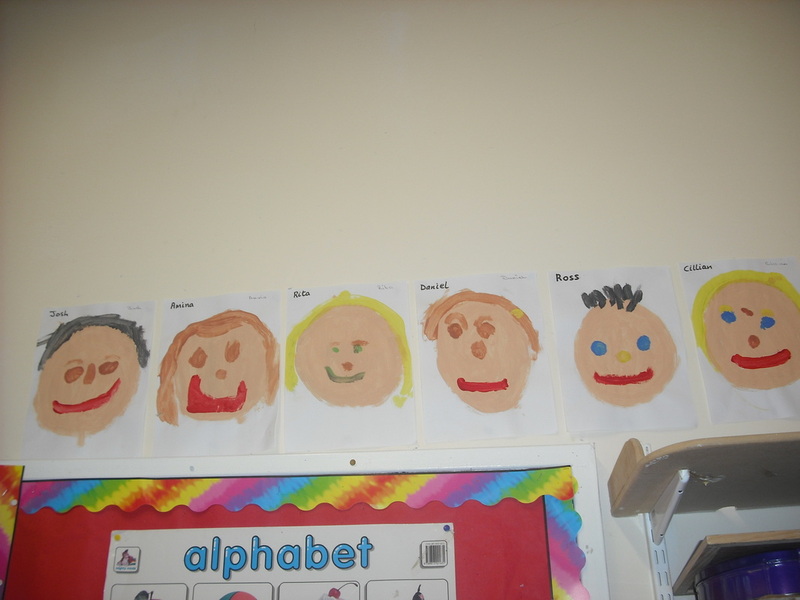 We chatted all about summer holidays and the children did lovely pictures of their favourite holiday or a favourite day out and about with their families. Some children were very creative and made what they called a hot wheel track. Wow, it looks great and they had good working together!!! We had another busy week this week in Room 2. In keeping with our 'Water' theme we enjoyed the stories 'The Snail and the Whale' and 'Sharing a Shell' and we loved singing and dancing to the cute song 'Little White Duck'. We learnt how to write the letter 'p'. To write it, we say 'down, up and around. The children are continuing to write great stories for our 'Story Wall'. In Maths, the children are doing brilliantly with their adding up to 5 e.g. 2 and 3 makes 5 or 2 + 3 = 5. In PE, we are getting ready for our Sports Day. Last Monday, we practiced the Egg and Spoon Race and the Bean Bag Race. It was great fun! 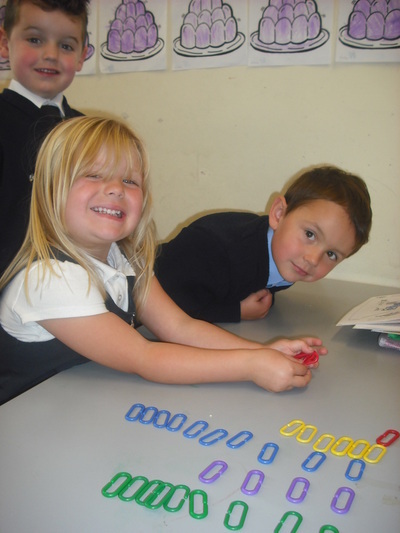 In Science, we learnt all about magnetism and had good fun using magnets in the classroom. We also investigated with objects to see would they float or sink. We guessed first and then tested it in the water. We used a pencil, a straw, a leaf, a key and lots more things. Sometimes we were surprised by the result! Well done to everyone who joined us on our WOW day last Wednesday. It was a great way to start the day! Look at two of our brilliant Monet paintings! We will have more up on the website next week. This week we learnt how to write 'h' and 'b'. To write 'h', we say: down, up half way, around, down and flick. To write 'b', we say: down, up half way and all the way around. Our theme for this week and next week is 'Water'. In Maths, we are learning all about capacity, using the language as follows: full, empty, half full, holds more than, holds less than and full to the top. We enjoyed a story about a baby whale that got lost but happily found his family again by singing! We also chatted about all the places where you can get water and Room 2 came up with an amazing and interesting list!!! In Science, we investigated how liquid can be made solid by freezing it. We used ice lollies to prove our theory!!! We then noticed that when an ice lolly melted, it become liquid again. Being Scientists can be thirsty work!! This week we learnt how to write the letters 'n' and 'm'. To write 'n', we say: down, up (but not to the top! ), around, down and flick. To write 'm', we say: down, up (but not to the top! ), around, down, up, around, down and flick. We really enjoyed the story 'We're going on a bear hunt'. We had great fun doing drama based the journey to the cave and back home! Have a look at our pictures outside our classroom. We had a lovely walk together for our School Sponsored Walk. Thank you to the parents who came along! A BIG congratulations and well done to these pupils on their great achievement. They each received a certificate for 100% attendance in school from Christmas to Easter!!! We are continuing to practice our sounds every day. We are also learning the name of the letter (i.e. a, b, c etc.) along with the sound it makes. 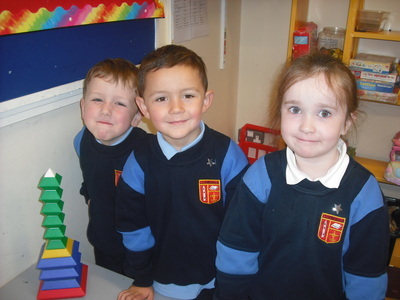 This week we learnt how to write the letters 't' and 'r'. The rhyme when writing 't' is: down, flick, lift your pencil and across. The rhyme for 'r' is:- down, up (but not to the top!) and around. We learnt all about the different types of transport and chatted about journeys we have travelled. We also talked about the importance of road safety (i.e. wearing helmets when cycling/on scooters) and we have been practising the Safe Cross Code. In Art, we made fabulous kites. You can see them outside our classroom. In Maths, we made charts to show how each child at every table travels to school. Have a look at one of them here and see that we can find out lots of information i.e. three children come by bicycle, two by car, one walks, one comes by scooter whilst nobody comes by bus! As we really enjoyed the story of 'The Enormous Turnip' last week, Ms. Galvin helped us to plant turnip and lettuce seeds. Maybe we will soon have an enormous turnip of our own!!!! We have learnt all of our sounds and have finished our Sound Books 1, 2 and 3!!! Every day we will be revising them. Room 2 are doing amazingly with their sounds and their reading and last Monday we started a 'Story Wall'. Already the wall is full of lots of great stories!! This week we learnt to write the letter 'k'. The rhyme when writing it is 'down, up, around, slant down and kick'. We really enjoyed the story 'The Enormous Turnip' and all had a part in doing drama based on it. We even did beautiful art to show our favourite part. In Science, we made Rice Krispies cakes. We investigated how heat changes solid chocolate to liquid chocolate. The experiment was a very tasty one!!! Our Easter Art looks amazing. We are all looking forward to Easter and our Easter eggs! Look at our amazing Easter bonnets! We really enjoyed showing them off at the Easter Parade. We made butter from cream!!! We all had a turn to shake the cream in a jam jar until the cream got thick. It took a long time and a lot of patience! We then drained the liquid and there was our lovely creamy butter. We ate it on crackers and it was yum! The plate and jar were empty in no time! We made brown bread too!!! 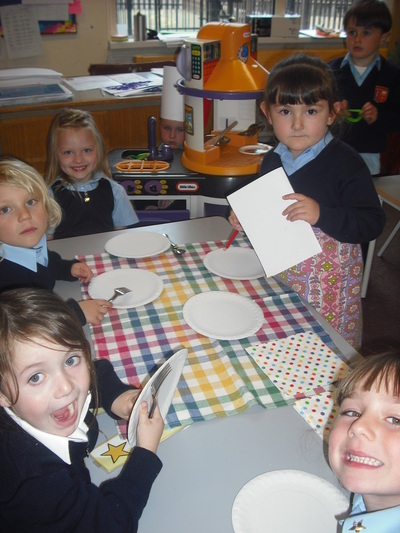 We enjoyed the story 'The little red hen' so much that we decided to make our own brown bread. It was even more delicious with raspberry jam!!!! This week in Maths, we were revising our 2D shapes. 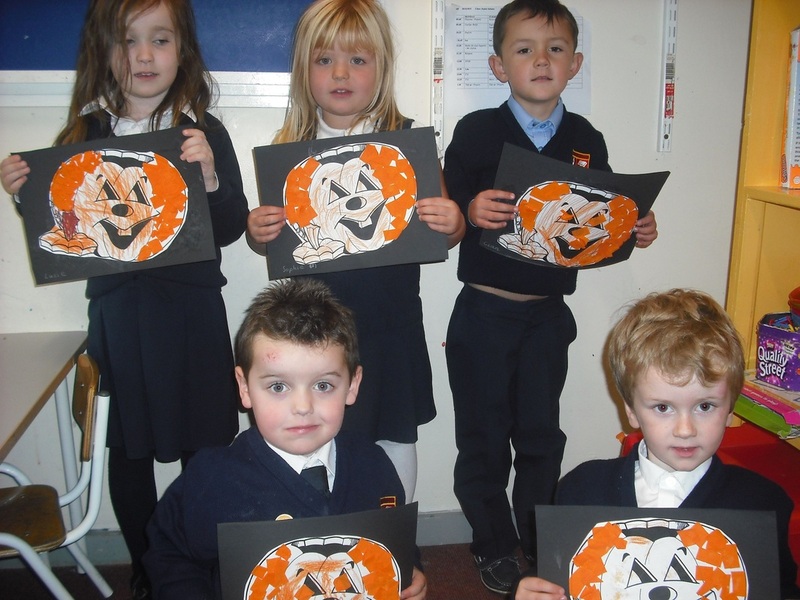 Some children made fantastic and very inventive pictures using the shapes. Our new sound this week was 'er'. We learnt how to write the letter 'j'. The rhyme for our new letter is: down, around and dot. Junior Infants were really amazing performing for the Ceolchoirm last Monday and really enjoyed themselves on stage. Don't they look great in their headbands!! Ceolchoirm 2015 - visit our archive to see lots more photos! Congratulations and well done to our winners! This week in Maths, we were revising our 2D shapes. Some children made fantastic and very inventive pictures using the shapes. The rest of the class will have a chance next week and we look forward to seeing lots more pictures. Our new sound this week was ‘ue’ and we learnt to write the letter ‘i’. The rhyme when writing it is - down, tail and dot. We made lovely Mother Day cards. We designed the edge with a pattern so they looked even more beautiful. Wow, look how our water cress seeds have grown. It was very exciting watching how they grew bigger every day! HAPPY SAINT PATRICK'S DAY TO YOU ALL! We have been very busy getting ready for the St. Patrick’s Day concert in school next Monday and are very excited about performing for the rest of the school. We made amazing headbands to wear on stage and have learnt two songs as Gaeilge. We also made prints of shamrocks (using slices of green peppers). These brilliant prints will be used to decorate the hall for the concert. ﻿﻿Our new sound this week was 'oi' and our new letter was 'q' . The rhyme when writing it is - around, up, down, down and kick up. We enjoyed a visit to the school garden to check out how the buds are coming on since our last time there and guess what but they are all Spring flowers now! We saw daffodils, crocuses, snowdrops and primroses. It was World Book Day yesterday. 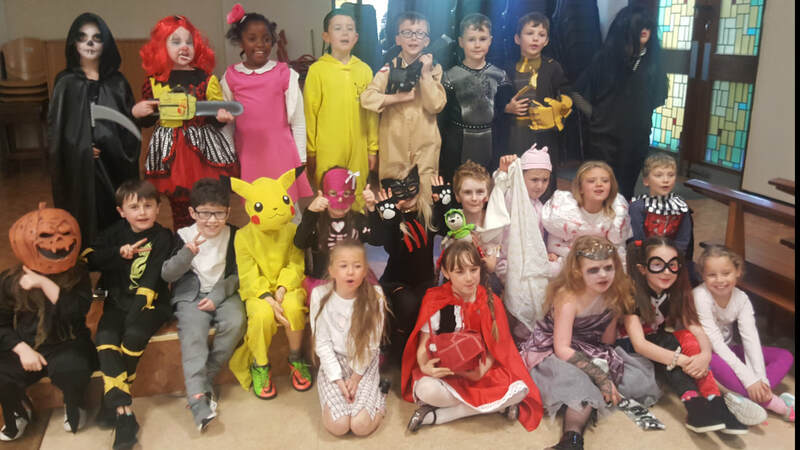 All the Junior Infants looked great dressed as their favourite book character. We had a visit from Aideen McBride, an author, who told us some great stories! We all had a fun day! In Science we germinated watercress seeds. We are watching them closely and see that they are changing and growing every day. We will update you on their progress again next week! Seeing all the beautiful flowers in the garden gave us the idea to make a classroom collage of Spring. We all worked together and we think it looks terrific! Some children made paper flowers, whilst others painted cherry blossom trees. The rest of the class made sheep with cotton wool and gave them funny moving eyes! 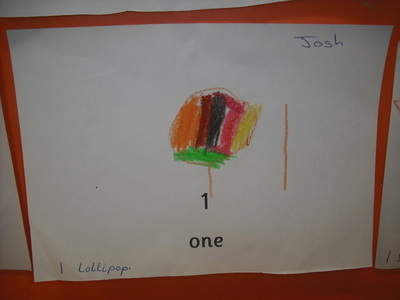 There was an Art competition by South Dublin County Council for Fairtrade Fortnight. Iga in our class won first prize in the 4-7 year old category. Well done Iga!!! Our new sounds this week are 'qu' and 'ou'. We are doing brilliantly at writing our letters c, a, o and d. This week we learnt how to write 'g'. The rhyme for 'g' is - around, up, down, down and tail. 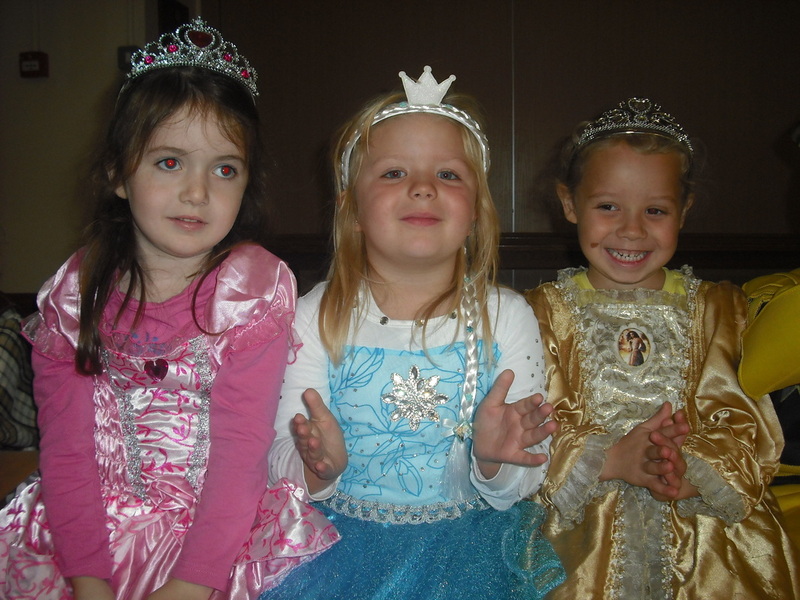 We had great fun doing drama based on the story of 'Goldilocks and the Three Bears'. We even did lovely pictures showing our favourite part of the story. We learnt a song 'When Goldilocks went to the house of the bears' to be found on the British Council website. It even shows a little video! 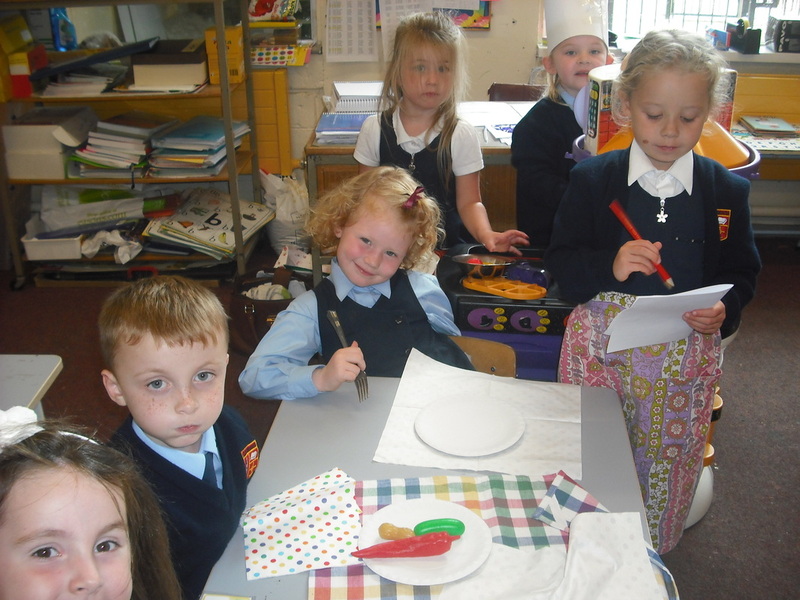 In Art we learnt about the famous artist named Monet and looked at some of his paintings of bowls of fruit. As we are really enjoying eating the delicious fruit during Food Dudes, we decided to paint our own paintings of fruit. We think our paintings are better than Monet's!!!! Here are some pictures of our favourite parts of 'Goldilocks and the three bears'. Look at our paintings of 'A bowl of fruit'. Wow, aren't they amazing and so colourful! d – around, up, up, down and flick. We are continuing with The Food Dudes Healthy Eating Programme. The fruit and vegetables are delicious every day and we are enjoying tasting new flavours! 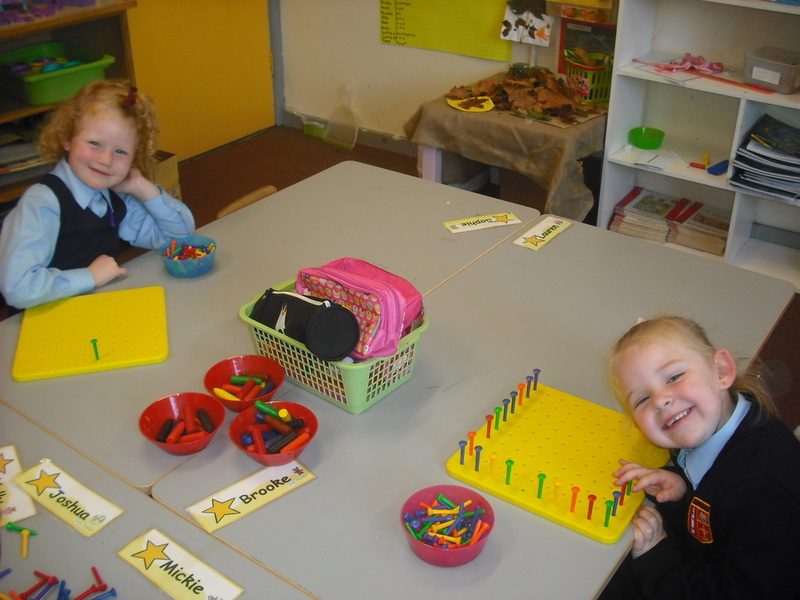 In Maths, we are making sets of four and learning how to write the number. This week was Engineers Week! We constructed amazing bridges from potatoes and apple slices. Have a look at our photographs in the hall. This week we learnt all about Spring. We had an adventurous walk around the school grounds and garden where we spotted lovely Spring flowers including pretty snowdrops and colourful primroses. There are lots of bulbs only starting to grow so we look forward to another visit when they have blossomed. We also heard all about Saint Brigid and her growing cloak!! Our new sound was ‘sh’. We enjoyed the poem ‘Painting’ and made a list of words ending with ‘in’. We loved the story of Goldilocks and the Three Bears! We chatted about our families. Come and look at our lovely coloured front doors outside our classroom!! We also did amazing work on our 'cut and paste' activity of a truck. This week was very special in Room 2 as the children began writing! They are all brilliant at writing their letters ‘c’ and ‘o’. We enjoyed the poem ‘Mix a pancake’ and made a list of words ending with ‘an’ for example pan, fan, can, ran and man. We talked about feelings and things that make us feel sad, angry and kind. Take a look at the lovely paintings to show how we sometimes feel. In Irish we learnt to say what our favourite TV programmes is for example ‘Is maith liom SpongeBob SquarePants’. In Maths we learnt all about length and when to use the language of long, short, longer than and shorter than. In PE we had great fun sprinting. All the children were amazingly fast at running. We also did relay races. Best of all though, we had a lovely Grandparents’ Day!! We especially remembered all the grandparents of the children in Room 2 who couldn’t be with us. Thank you to those who could come along and enjoy a poem and song with us. We’ve had another busy week in Room 2 working hard and learning lots of new things. 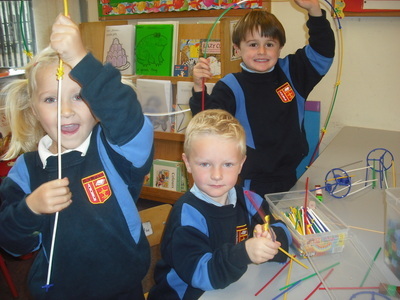 In English our new sound was ‘x’ and we enjoyed the funny poem ‘Feena begins to knit’. We made a list of words which end with ‘it’ (sit, knit, bit, pit, fit and hit). Also, we enjoyed reading and chatting about the story ‘The Gingerbread Man’. In Gaeilge, we can say ‘Is maith liom … / Ní maith liom …’ (I like … / I don’t like …) when talking about food. In music, we had great fun exploring ways to make music and rhythm without musical instruments e.g. clapping hands, tapping the table etc. All the children came up with their own individual and very interesting rhythms! 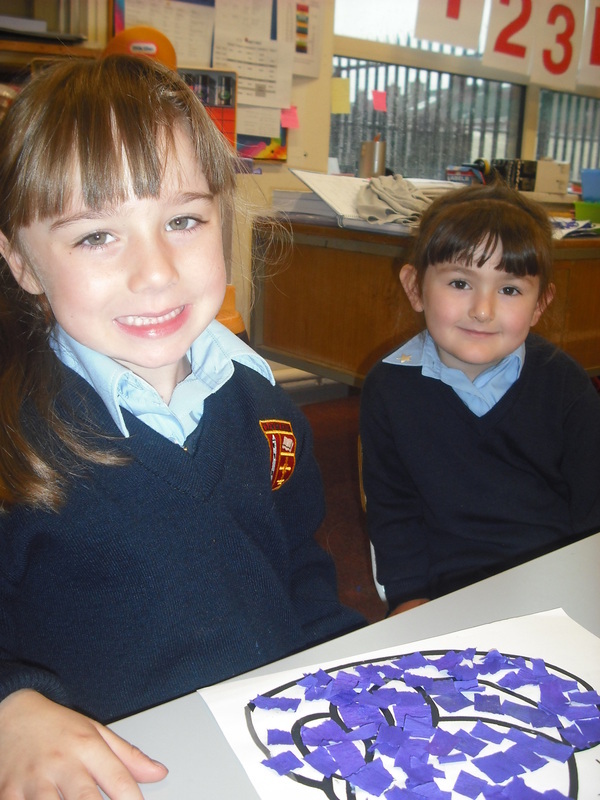 In Maths, we made lovely patterns using two or three different colours. Take a look when you are passing our classroom. They are really colourful! As part of Catholic Schools' Week, we designed pictures of candles and made a big class poster which looks amazing! We talked about feelings and things that make us feel happy and things that make us feel scared. In Science, to show that we care about all the animals, birds, insects and water creatures on our planet, we chatted about where they like to live and where they feel safe (pond, garden, beach or woodlands). We are already getting ready for Grandparents' Day next Friday and did some beautiful art work using our hand prints. This week our new sounds were 00 and OO. We enjoyed the poem ‘Globby’s Pot’ and made a list of words that end with ‘ot’ (pot, cot, dot, got, hot, not). In Maths, we were sorting big and small things and continued to practice writing the number 3. In Science, we learnt all about the life of the Emperor Penguin and how the baby chick survives living in the coldest place on earth! In History, we enjoyed chatting about our favourite toys during ‘Show and Tell’ and we found out what our parents/grandparents played with when they were little boys and girls. We also painted amazing paintings of our favourite toys. We learnt all about Biodiversity and the importance of taking care of our world by recycling, saving water, saving electricity etc. We even made a class collage to explain it! This week everyone kept a weather chart and recorded the weather for each day. We even know how to say it in Irish!!! Our new sounds are’ v’ and’ y’. In Maths, we learnt how to make a set of three and how to write the number three. We enjoyed the poem called ‘Winchella’s Nap’ and made a list of words that end in ‘ap’ (nap, cap, rap, tap, map and zap). We found lots of things in our classroom made from different materials (glass, wood, metal and plastic). We also investigated which materials are waterproof or not waterproof. We enjoyed the story of the Three Billy Goats and did some amazing art based on the story. 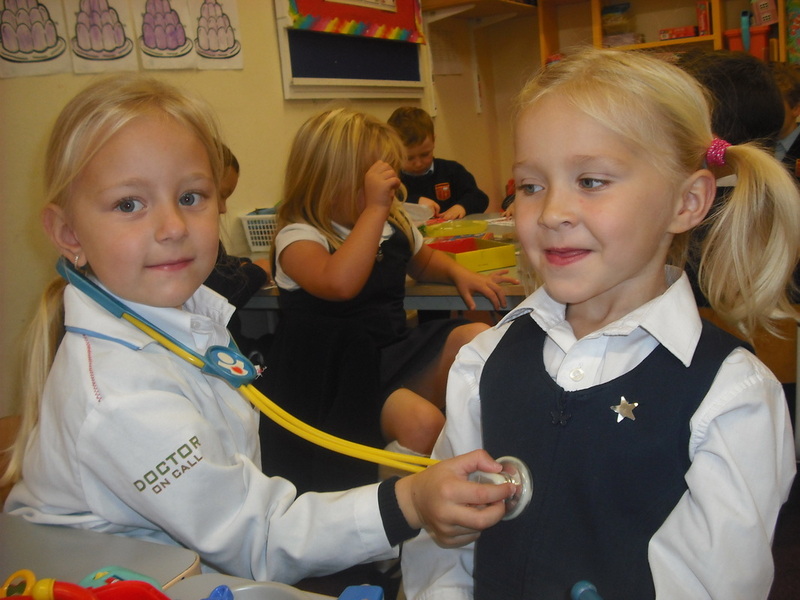 We had a busy week in Room 2 getting ready for the Junior Infant Nativity Play. We sang ‘Rock your Baby’ and ‘Mary’s Boy Child’. We loved singing them and especially enjoyed doing all the actions! In class we also sang Silent Night and other Christmas songs; Jingle Bells, Rudolf the Red-Nosed Reindeer and Frosty the Snowman. We watched some of the DVD ‘The Snowman’ which we loved watching together. In English we did two new sounds (ie and ng) and the poem ‘The Owl and the Pussycat’. We worked hard at figuring out the picture which was ‘the odd one out’. We read the story ‘The Night Before Christmas’ along with other Christmas stories. We recalled the Nativity Story and did picture sequencing on it. We wrote a letter to Santa in our best writing which is displayed outside our classroom along with some Rudolf Art Work which looks amazing! Happy Christmas from us all in Room 2!!! 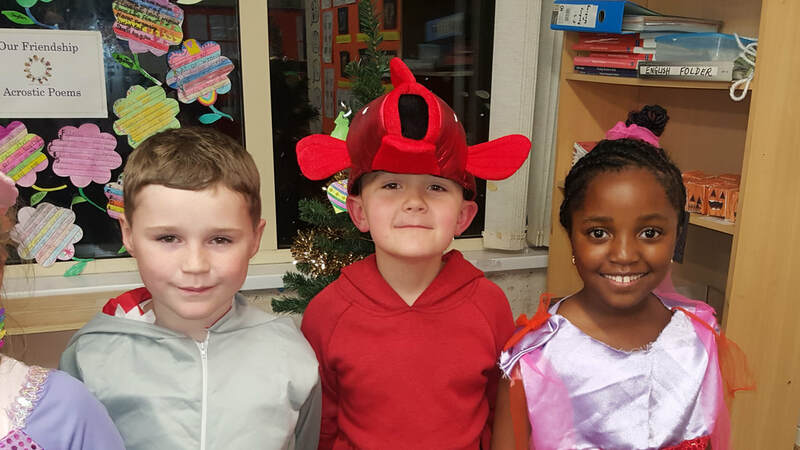 This week we have been very busy learning lots of new things including talking all about Christmas and Christmas traditions and The Nativity Story. We loved singing Christmas songs and Carols. We especially enjoyed 'When Santa got stuck up the chimney'. In Art, we made a big Christmas tree using our handprints! Our new sounds this week are w, z, ee and or. 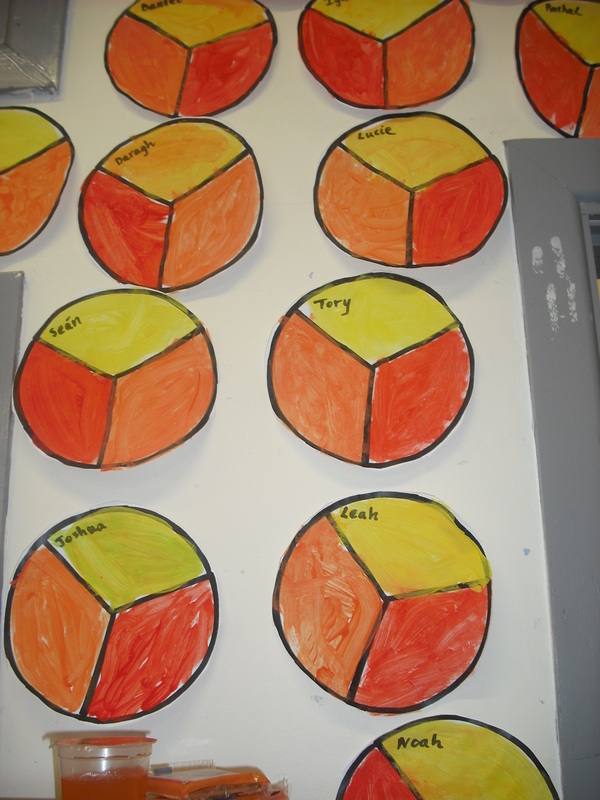 We did great work in Maths making patterns using two or three colours. 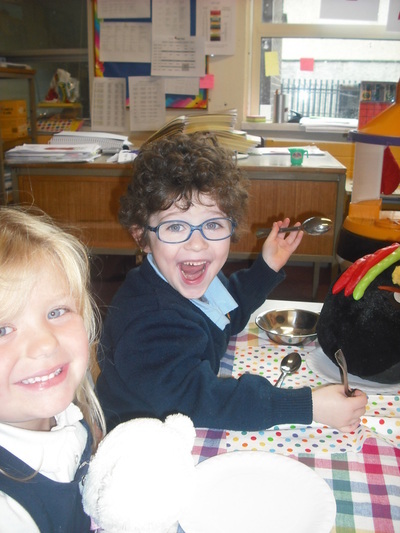 We learnt all about the Robin Redbreast and the food he likes to eat. 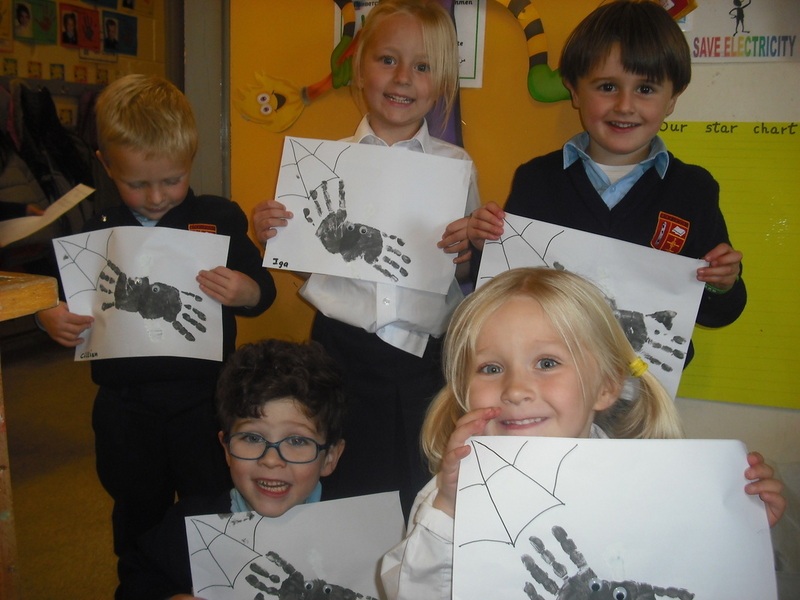 On Thursday, we were delighted when some parents visited to help us sequence pictures of the rhyme Incy Wincy Spider. We had great fun learning our lines and practicing for the Christmas Concert. We all really enjoyed being on stage!! Don't we look brilliant in our sheep costumes? 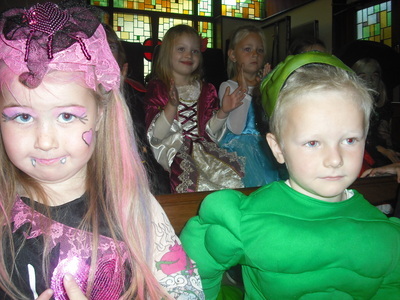 Everyone looked brilliant all dressed up in their costumes. Happy Halloween!!!! We are all very excited about Halloween. Look at our amazing Halloween art!!!! Getting to know our new friends in school! Here we are getting to know each other and enjoying working and playing together. We learnt about Vincent Van Gogh. Look at our beautiful portraits!!! We love Maths in Room 2! In Maths, we are learning our colours, shapes and how to count, sort and match. We love dressing up and playing make-believe. We had great fun pretending to be in a restaurant and at the Doctor's Surgery!